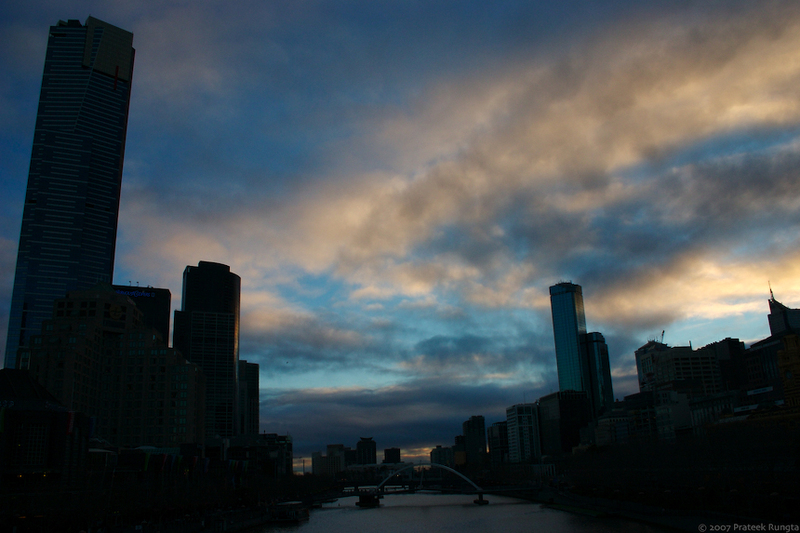 Melbourne’s weather is not showing any signs of getting warmer. The good thing was we got to celebrate Christmas in July — a Roberts Hall tradition. Wish Delhi was like Melbourne. Rungta, you got a knack of capturing great shots of the skies. BTW, what happened to the EXIF data? Looked pretty cool on the site; even if half of it seemed Mermish. It's an amazing change to see skyscrapers and tall buildings in metropolitan cities without their glitter of lighted windows! Siavash, I'm flattered. I was actually in Delhi before I came here and I have posted a few pictures of Delhi earlier. Aditya, thanks for pointing out about the EXIF data. I had a feeling something was wrong with my blog. Varenya, dark effect in what sense? Sumedh, it sure is a nice change. I was surprised myself when I saw how nice the shot turned out. nice…. nothing more to say!! Good to see you back Rashmi! love the picture..the sky is so beautiful..but it looks a little gloomy..